Comet Pan-STARRS: Bright comet will be visible starting around March 8. Comet Pan-STARRS on Mar. 3, 2013, from Victoria, Australia. This shot, by Phil Hart, is one of the best pictures I’ve seen of it. Northern Hemisphereans, alert! The kinda-sorta-maybe bright comet Pan-STARRS will soon be visible low in the west after sunset. The best dates to look will be Mar. 12 and 13, when the very thin crescent Moon will guide you. You’ll need binoculars to pick it out of the twilight sky, but comets this bright are rare, and you should give it a shot. Comet C/2011 L4 (Pan-STARRS) was discovered in June 2011 by the Panoramic Survey Telescope and Rapid Response System (hence the odd name). At discovery it was incredibly faint, just 19th magnitude—the faintest star you can see with your eye is still 150,000 times brighter than the comet was at the time! The comet is non-periodic, a fancy way of saying this is the first time it’s dropped into the inner solar system. There is a reservoir of trillions of such iceballs far, far past Neptune, called the Oort cloud (named after Jan Oort, the Dutch astronomer who was one of the first to predict its existence). Pan-STARRS has been falling from this distant region for a long, long time, perhaps millions of years, and is now approaching the Sun on its incredibly outstretched orbit. It reaches perihelion (the closest point in its orbit to the Sun) on Mar. 10, and then begins the long climb back out again. It has brightened considerably over the past couple of years as it’s neared both the Sun and Earth, and by Mar. 12 should be at least as bright as 2nd magnitude, about as bright as the stars in the Big Dipper. It could get even brighter. By the way, this comet is not associated in any way with the one that will give Mars a very close shave next year, or Comet ISON which should put on quite a show later this year. Also, it never gets very close to the Earth. At more than 160 million kilometers (100 million miles) away, Pan-STARRS is already about as close to us as it will ever get. elongated, never bringing it very close to Earth. 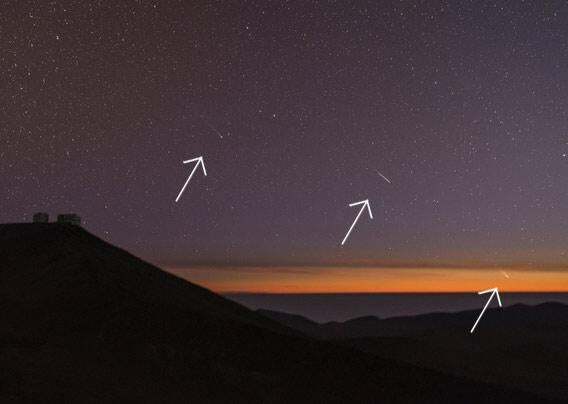 The comet has been high in the skies for people in the Southern Hemisphere for weeks now. 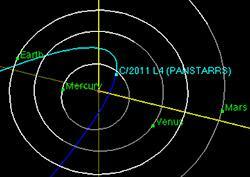 But the comet’s orbit is tilted nearly 90° to the Earth’s orbit, and it’s currently moving rapidly to the north. For most of us in the northern hemisphere, it’ll just start to appear over the western hemisphere after sunset around March 8, but it’ll be so low you’ll need a flat horizon, clear skies, a decent pair of binoculars or a telescope, and a bit of good luck to spot it. But over the next few days it’ll get higher and easier to spot. But be ye fairly warned, says I: It will set very rapidly, so if you want to see it you’ll need to be ready at sunset! Due to the geometry of its orbit, it’ll never get more than about 10°-15° degrees above the horizon, about the width of your outstretched hand. Any time after about March 10 will be good for spotting it, but the best date is Mar. 12, when the very thin crescent new Moon will be close by. That will make the comet easier to find, since the Moon is bigger and more obvious. But even then, binoculars are your friend. A couple of weeks ago I was trying to find the planet Mercury in the twilight gloaming, and it was tough until it got dark enough… and Mercury is much brighter than the comet. Gabe Brammer took this amazing photo showing Pan-STARRS (arrowed, on the right), a meteor (middle) and aonther comet, Lemmon (left). I had to crop this image to make the comets visible; click it to see it in higher resolution. It’s stunning. I don’t want to discourage anyone from trying to find it; I’m just trying to be honest here. 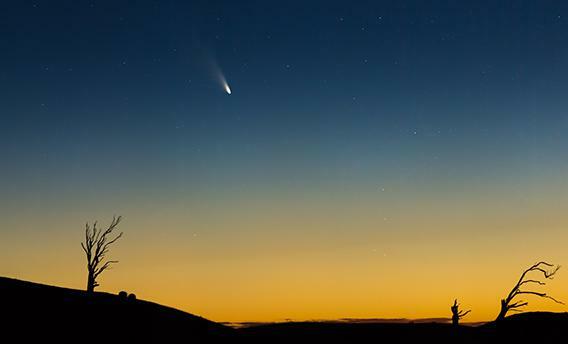 While in straight numbers the comet is a bright one, twilight is a fierce competitor. Unless it brightens considerably in the next few days (which is unlikely) you really will need binoculars to see it. If it helps, I personally will be out every sunset looking for it. I hope it gets above the mountains to my west! I’ll be using binoculars and, if I can, my telescope. I’ll try to get pictures, too, but no promises there. For more viewing information, you can read what’s online at Sky and Telescope magazine, EarthSky, the Institute for Astronomy at the University if Hawaii, and UniverseToday. If you miss Pan-STARRS, don’t fret. Later this year, Comet C2012/S1 (ISON) is expected to get very bright for those of us in the north (I’ll have more on that in a later post, promise). ISON will pass the Earth at a distance of about 60 million kilometers (35 million miles) at a very favorable geometry, and may get decently bright. No one’s really sure—comets are notoriously unpredictable that way—but it seems almost assured it will be a good naked-eye comet. There’s also the comet C2013/A1 (Siding Spring), which will brush past Mars in October 2014; it never gets very close to Earth, but may be favorably placed for observing from Earth as well. I’ve seen dozens of comets over the years, some so faint they were difficult even with a telescope, and one so bright that I spotted in broad daylight! Every comet is different, every comet is cool. If you get a chance to see Pan-STARRS—either on your own, with a local astronomy club, or at a nearby observatory—I’d urge you to take it. And if you get good or unusual pictures of this apparition, please send them to me or the folks at UniverseToday.com. We’d love to post them!